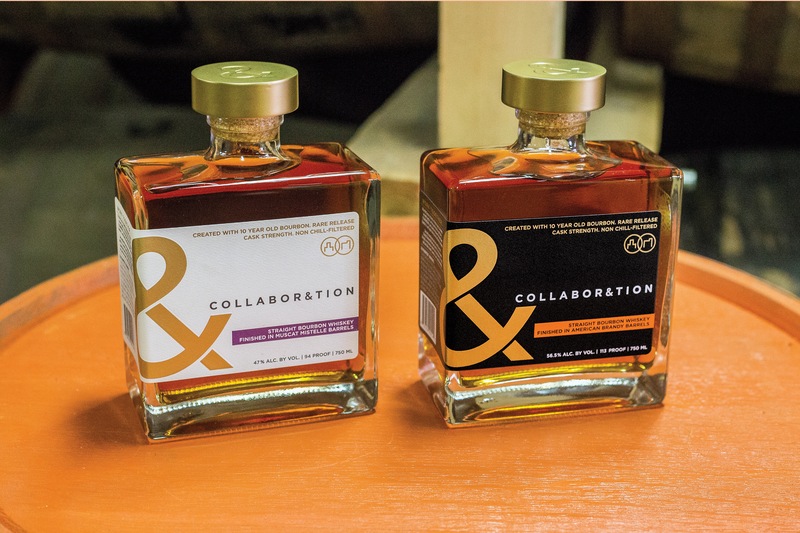 The Bardstown Bourbon Company joined forces with Copper & Kings for Collabor&tion, a limited release of two different whiskies. Started in 2015, Collabor&tion is a project two years in the making. Both products start with a 10-year-old bourbon from MGP. One spends more than 18 months being finished in ex-American brandy casks from Copper & Kings and bottled at a cask strength of 113 proof. The other release sees a similarly extended secondary maturation period in Muscat mistelle barrels bottled at a lower 94 proof. Both whiskies are non-chill filtered. I’m a big fan of Copper & Kings, and MGP can produce some wonderful whiskey. Bardstown Bourbon Company selected the barrels used for this release, and both companies worked together on the blend. So, how are they? In a word – fruity. I should elaborate. Let’s start with the whiskey finished in Muscat mistelle casks. First, what’s mistelle? It is unfermented grape juice fortified with unaged brandy. The nose is full of caramelized fruit, plums, and a slightly musty quality. On the palate, Muscat grapes permeate the bourbon’s DNA. The whiskey’s dark caramel gives way to the dark fruits, citrus zest, and some oak. The long finish leaves some spice, fruit and slight floral notes. The other release, finished in ex-American brandy casks, starts with a more robust nose showcasing hints of mulled wine, brown sugar, lemon oil, and oak. Tastewise, spice and citrus are layered on top of velvety caramel and fruit jam. Some oak tannins make their appearance going into the finish, which brings to the forefont the whiskey’s concentrated spiced fruit character, soon becoming dry. Here’s the thing: I don’t smell or taste anything that resembles bourbon. The spirit’s character is completely overtaken by the barrel finishing, thus my aforementioned use of the adjective ‘fruity’. In other words, these releases are more brandy/mistelle and less bourbon. As they stand, however, Collabor&tion is quite delicious. I would happily buy a bottle of the brandy cask-finished whiskey, but I would struggle to call it bourbon. Thanks to the Bardstown Bourbon Company for the samples. As always, all thoughts and opinions are my own.